Q: I'm stuck in a certain area and there are no more races around. What to do? Make sure you've upgraded your car to the max - that means everything in all four shops. Some magazines/DVD covers will only be available when your car has a certain reputation. Check your current sponsor's requirements. Each sponsor in every stage requires you to win a certain amount of races. Look for hidden races that don't appear on the map. These are the ones those guys are talking about on the SMS. There are 3-5 hidden races in each stage. Q: How do I rotate the car in the showroom? A: For the PC, Hold down the middle mouse button and move the mouse left or right. Consoles use the right joystick by default. Q: Which is the best car to start with? A: There's a lot of disagreement on this. My advice: work it out yourself. They're all pretty much the same, and you can always change later if you don't like the car your chose. Q: How do I unlock Car X? Q: What's the deal with magazine covers? When do they come? A: Magazine photoshoots are earned by winning races. Rachel will tell you to hightail it to a location for the shoot. Check the map for a Special Event star, set your GPS and floor it. Q: Okay, so what's the deal with DVD covers? A: DVD covers are earned as your pass each of the 10 major visual star ratings. So there are ten to collect. Rachel will SMS you about it, head to the Special Event location on the map. Once there, you will have to make it to another Special Event star within a time limit to get your DVD cover. Q: What are the unique parts and how do I unlock them? Stage 5, 11 wins - Widebody Kit (Not available for SUVs). Q: Where are the shops located? Q: Do I keep all my upgrades on a car when I trade it in like in NFSU1? A: No, all upgrades are gone just like they would be in real life. Q: When I get a unique upgrade, does it go on all cars I have or only the car I was using when I got the upgrade? A: You only get the upgrade on the car you were using at the time. Q: Can I post pictures of my garage here in the forum? A: No. 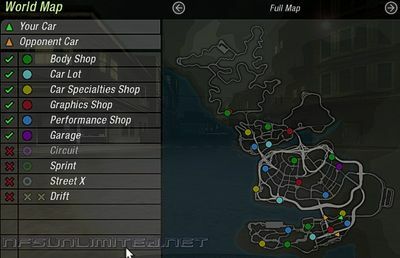 Create a garage in the NFSU2 Showroom and post them there. Q: I want mah cheats! Where do I find cheats? Q: Rachel is asking for her car, but I don't have it. Why? A: This is a happens when you use the World Map (available from the Garage) to go back and do the races that were around at the time you actually had Rachel's car. Ignore her. Q: What are stylepoints and what do stylepoints do? Nitrous Sprayshot - Purge the nitrous lines by tapping the nitrous key. Avoid Accident - This is a near miss with a traffic car. Clear Section - Run a section of a race without hitting anything major. Hydraulics - Using your hydros. Try it while in the aire after a jump. Reverse - Run in reverse for a while without smacking into stuff. Leap Lap - Be in first place as you cross the start/finish line in circuit and URL races. 360 Spin - Doin' a bit of circle work is good for a few points. J-Turn - FnF style reverse-to-forward turn. Headstart - Get the jump on the Ai at the start of a race. Burnout - The opposite of Headstart - burnout for points and a place at the back. Shortcut - Run through a shortcut section. Hangtime - Get air. The more the better. Cleared Accident - Rare. Jump over traffic without death or permanent disfigurement. Q: What are reputation points and what do they do? A: They show you how COOL your ride is. Build your rep by adding the the visual appearance of your car. They range on a scale from zero to 10. As you pass each rep milestone (1, 2, 3 ... 10), you'll get a DVD opportunity. Q: Can I post spoilers? (Info that can spoil the fun for others, like the ending of the game). A: NO! Leave some fun in it for the ones who haven't completed the game yet. Q: Got any good tips and strategies? A: Well yes, but EA have already done a great job. Clicky here. There are also some great tips from gofra posted below. Q: Will I unlock everything at the end? A: Yes. Once you complete the game, all performance and visual upgrades are available in Quick Race mode. Unlike NFSU1, you can then return to your garage and re-race any event from career mode. Outrunners are still buzzing around at that stage as well. Q: Where is the savegame folder located? A: On a winXP/win2000 you will find the Need for Speed Underground 2 savegame in C:\Documents and Settings\[your username]\Local Settings\Application Data\NFS Underground 2 dir. You can also do a search for "NFS Underground 2". Just make sure you check the "search hidden files and dirs" option. Q: The screen in game is all black. What should I do? A: First download and install the latest drivers for your graphics card and if you still have problems, turn off certain options (light trails) in the graphics settings. Still no luck? Check with EA to make sure your video card is actually supported and capable of running the game. You may need a hardware upgrade. Q: I still gots problems! Help? A: Try EA Support, or make a post in our Help & Support forum. This page was last modified on 8 January 2010, at 15:02. This page has been accessed 295,748 times.